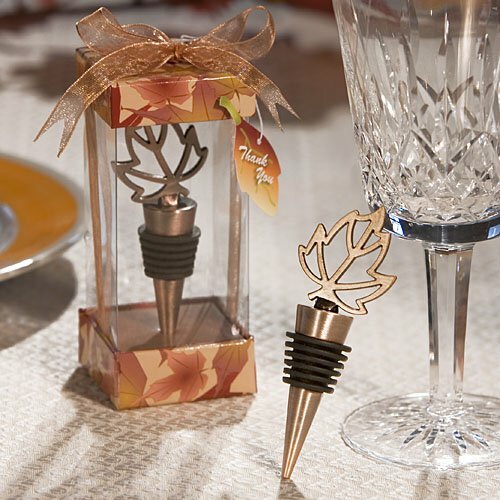 If you're planning a fall wedding, our autumn leaf bottle stoppers will make a great addition to your event. Part of our vineyard collection, these favors measure 4 1/4" x 3/4" x 3/4" and featured a sturdy bronze colored metal core lined with a black rubber stopper rim. The leaf silhouette on top is stylishly titled to one side. Each favor is packed upright in a deluxe clear box with a fall design top and bottom allowing a dramatic 360 degree view of the favor, then finished with a sparkling bronze organza bow and an attached designer leaf shaped thank you tag. Would these Leaf Bottle Stoppers fit into bottles like Jim Bean and Jack Daniels? I'm sorry, since we're not clear on the size of the openings for those bottles, we're not able to answer this question. They're meant to fit standard wine bottles. You could buy 1 sample on our site before placing a larger order to be sure it will suit your needs.